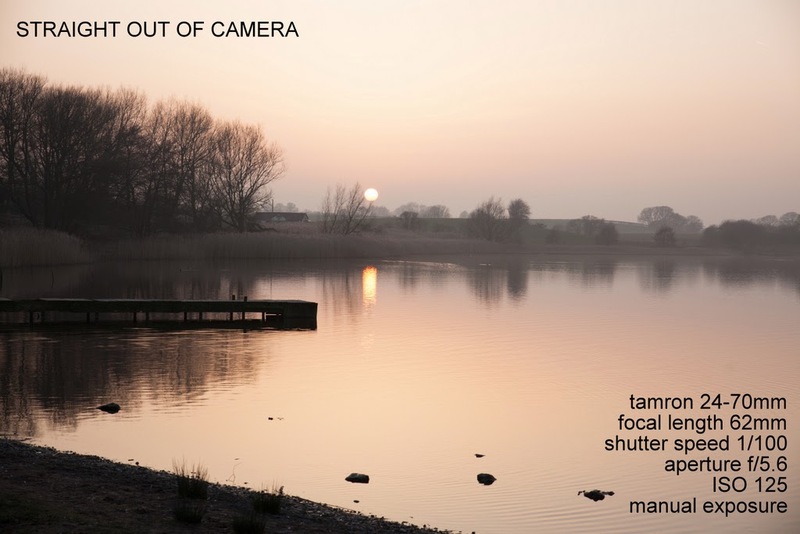 Find out how to shoot in Manual Mode. 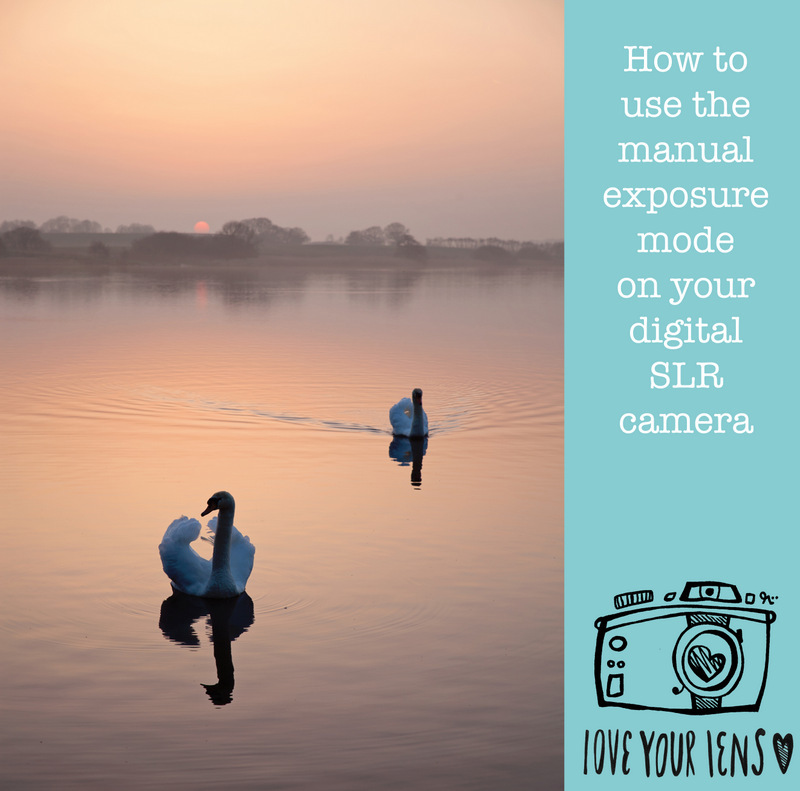 If you’ve started to get to grips with using the P (Program) or A (Aperture) modes on your camera (bridge or SLR), then you’re ready to start using M for Manual Exposure too, even though it probably feels like switching off Autopilot and landing the plane yourself! When I’m teaching people how to use their cameras, the first thing I do is get them on to the P mode, which is still like flying with autopilot switched on, but you can intervene and use some controls if you want to, without causing the plane to crash! (I’m a Canon shooter. If you use a different brand, things may be labelled slightly differently but the principles are still the same). 1. Shutter speed. 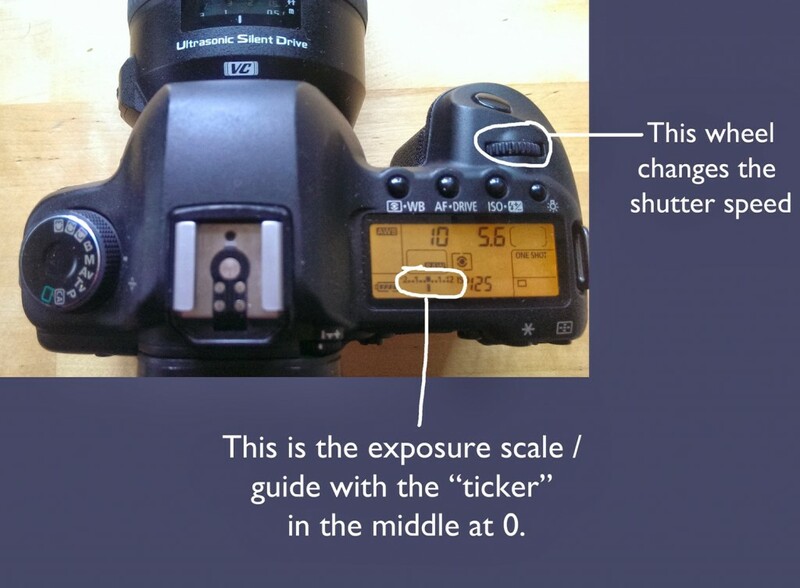 How fast the shutter moves out of the way to let light onto the sensor. 2. Aperture. How big the hole in the lens is. 3. ISO. How sensitive to light the camera sensor is. 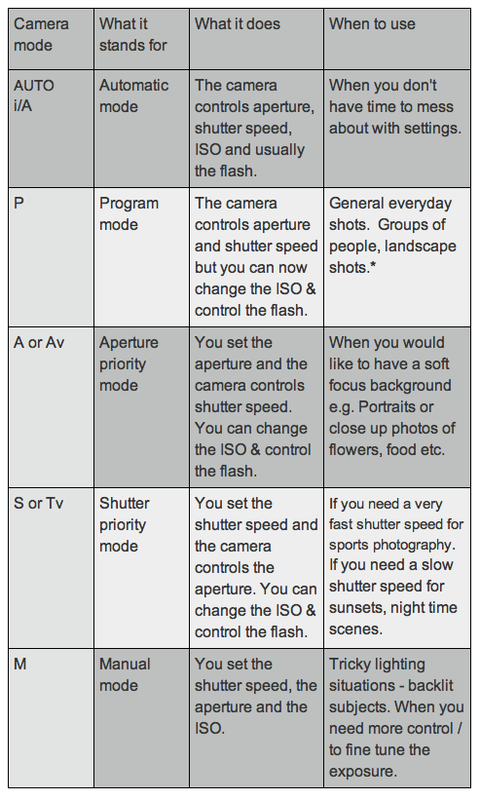 Here’s a summary of what the main modes on your dial do and when you should use them. * Professional landscape photographers will often use aperture priority mode and set a high f/number (small aperture) to get the whole scene in focus. They will usually need to use a tripod because the shutter speed will be very slow. Once you’ve got comfortable using the P mode, it’s quite an easy step to start using the A / Av mode. 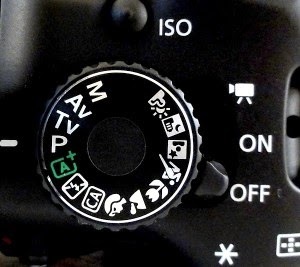 Many photographers find that once they’ve started to use this, they never go back to P or Automatic. The S / Tv mode for controlling shutter speed is used mainly for fast sports photography or for low light / night time situations, so is typically used less by your average photographer. Set the aperture for the depth of field you require – lower f/numbers for soft focus backgrounds and higher f/numbers for landscapes etc. Once this is set for the type of shot you are taking, you usually don’t need to change this to get the correct exposure. Set the ISO for the light conditions. Low for very bright conditions, higher for low light situations. At this point this is a guess and you will be altering it to get the correct exposure. Set the shutter speed, fast to freeze movement or slower for purposely blurring motion e.g. waterfalls etc. Once you have done this, you need to look at the exposure scale and see where the ticker is. You then adjust ISO or shutter speed to adjust it, with the aim of getting the ticker to move towards the centre. 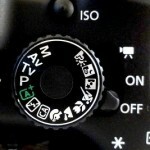 To darken the exposure: increase the shutter speed or reduce the ISO. 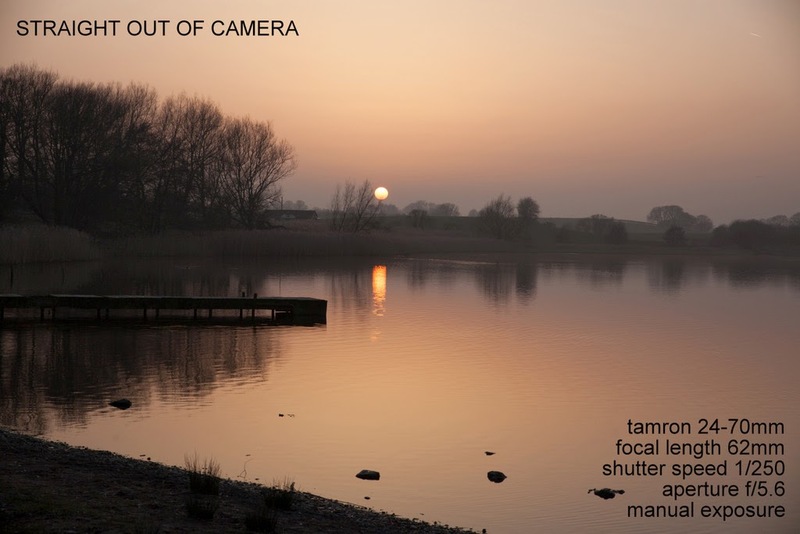 To brighten the exposure: reduce the shutter speed or increase the ISO. You now have full control and can purposefully under or over expose the image to get the result you want. I used manual mode to take this series of sunset shots. P or A mode were giving me images that were too bright, so I switched to Manual, set the aperture to f/5.6 as I was happy for the background to be a bit hazy and soft. I then took a photo with the ticker set in the centre and it was too bright, so I moved the ticker to the left one or two jumps and took another. This had the effect of increasing the shutter speed and making the image darker. Remember that natural light changes all the time so you need to be checking the scale and the ticker all the time as you look through the view finder, as you may have to keep making small alterations. The best way to get to grips with Manual mode is to try it out when it doesn’t matter if you get it wrong and make a mistake. After a few goes you will feel more confident and before you know it you’ll be using it all the time! Love Your Lens – what is it all about?